For every action... Lincoln Baker, born a ward of the state, has gone from orphan, to gang banger, to basketball superstar, to lifer at the Louisiana State Penitentiary in the space of eighteen years. During his prison term, he meets Panama X, a powerful and mysterious father figure who gives Lincoln a reason for living - he must assassinate Randy Lafitte, the sitting Governor of Louisiana. There is an equal and opposite reaction... Lincoln orchestrates the kidnapping of Karen Lafitte, Randy's only daughter. But Randy Lafitte is a man who built his fortune by resurrecting a family curse from slavery to kill his own father. A curse that may or may not have been responsible for his son Kristopher's death in the gang crossfire that sent Lincoln to prison for life. Randy will stop at nothing to save his daughter, even if it means admitting the curse is real. Even if it means committing greater atrocities. Too bad for anyone stuck in the middle. Three days after Karen's kidnapping, an explosive cocktail of revenge, manipulation, serendipity, fate, truth, and redemption detonates throughout Louisiana. When the dust settles, the ending is as unexpected as it is illuminating. There are secrets sealed in our blood, you see. The best answers, as always, lie within. The reason that Qwantu Amaru 's One Blood caught my attention was the mention of Louisiana, slavery and curse. I was curious to see where he would go with this. I really want to say that Amaru pulled the plot off. He sort of did. One Blood was unique but there was just too much. There was too much ground to cover and it affected the flow of the overall story. 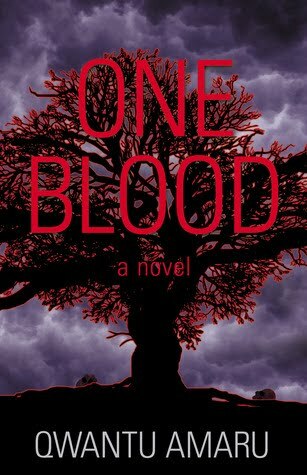 Normally, book liked One Blood (thriller and horror) are easy reads for me, that I speed through and eat up. This time I found myself putting the book down after a couple chapters and resting. The book goes back and forth from present day to past. At times there are markings to let you know what time frame this chapter is set in but at other times there aren't, which can get confusing. As I mentioned before there is a lot of ground to cover, I think if was less information and backstory this would have been a better read. I just think the story was too "complex", it had too many parts. I found myself saying "WTF" a couple of time because information just did not seem to add up or it contradicted something for earlier in the novel. Another issue I had with One Blood was that there were just too many characters to keep up with. There were like 10 that were important, and then there were a bunch more. It was impossible to connect with 10 characters, making it hard to connect with just one. While the synopsis says this is a story about Lincoln at thought this was more a story about Randy Lafitte and his family. Most of it had to do with them, Lincoln just seemed to get caught up in all there drama. Amaru is a good writer and was able to keep my attention. I did want know what happened next and curious to find out how One Blood would end. I do look forward to reading more of his work in the future. I would recommend One Blood who is a horror/thriller fan. It probably is not for a newcomer to the genre. But I would caution people that at times this book could be a little exhausting. I received this book at no charge in exchange for an honest review.